The difference between similar and congruent triangles is that similar triangles do not have to be the same size. 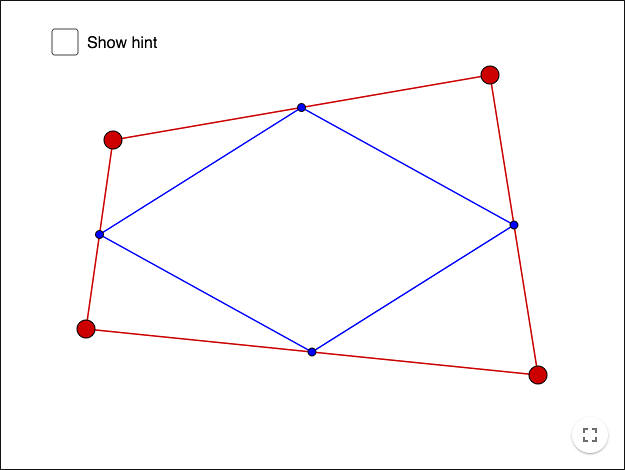 Interactive help to prove the triangle proportionality theorem. A transversal is a line that intersects two or several lines. Theorem: A transversal that is parallel to one of the sides in a triangle divides the other two sides proportionally. where \(w\) is the width and \(h\) is the height of the triangle. Compare areas three times! 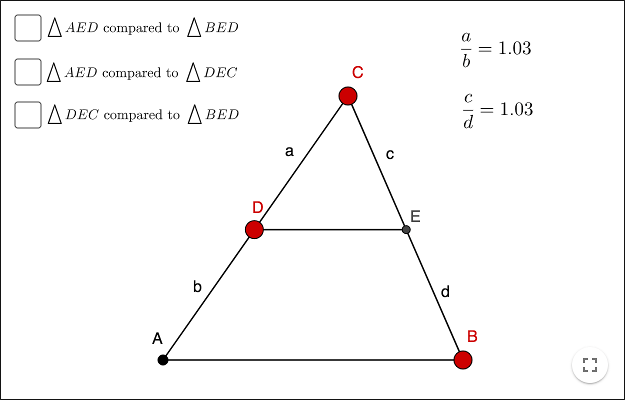 Make a triangle \(poly1=\bigtriangleup AED\) and a triangle \(poly2=\bigtriangleup BED\). 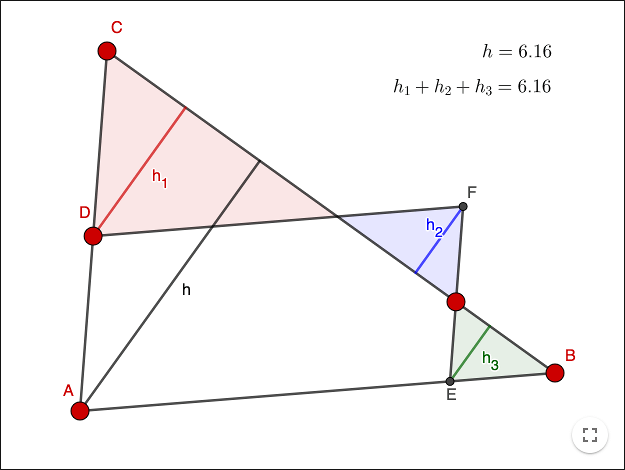 Let \(poly1\) and \(poly2\) denote the areas of the triangles. What is the ratio of \(poly1\) and \(poly2\)? Prove your answer! Make a triangle \(poly3=\bigtriangleup DEC\). What is the ratio of \(poly3\) and \(poly1\)? Prove your answer! What is the ratio of \(poly3\) and \(poly2\)? Prove your answer! Corollary: A transversal that is parallel to a side in a triangle defines a new smaller triangle that is similar to the original triangle. Show that corresponding angles in the two triangles are congruent (equal). Side-Angle-Side (SAS) If two sides in a triangle are in the same ratio to two corresponding sides of another triangle, and if the included angles in both triangles are the same, then the triangles are similar. Place the point \(G\) such that \(AG=DE\). Draw \(GH\) such that \(GH\) is parallel to \(BC\). Then the congruence case Side-Angle-Side yields \(\bigtriangleup AGH≅\bigtriangleup DEF\) and the proof is done. The proofs of the other two cases are similar. Side-Side-Side (SSS) If three pairs of corresponding sides are in the same ratio then the triangles are similar. Angle-Angle-Angle (AA) If the angles in a triangle are congruent (equal) to the corresponding angles of another triangle then the triangles are similar. Also note that it suffices that two angles are equal (why?). The line through C is parallel to AB. triangle \(\bigtriangleup BCE\) is an isosceles triangle, and hence why \(BC=CE\). 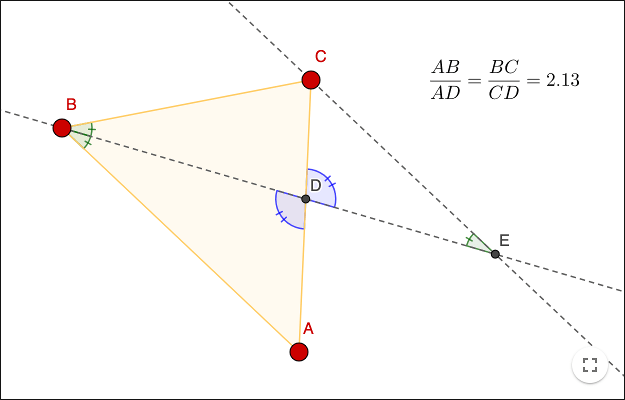 \(AC\) is parallel to \(EF\). \(AB\) is parallel to \(DF\). The heights \(h\), \(h_1\), \(h_2\) and \(h_3\) are perpendicular heights in the triangles. Prove what you see! The blue points are midpoints on each side. Prove what you see!